A cute and fun free-to-play RPG Lite, featuring an established IP (Which I am currently not allowed to name directly, or show images of the main character). Players get to personalize their character, build and decorate their house, go on quests and adventures for loot and other rewards, and socialize with other players from around the world! Unfortunately, this game has been shelved for the foreseeable future, but it was a fantastic project to work on with a super talented team. I hope to have the opportunity to revisit it some day. “Kings VS Queens” is an EPIC mobile strategy game we handcrafted with Love, Passion and Creativity where players choose to build their empires as either Kings or Queens. Each army has its own unique strengths and suits a different style of play tailored to the habits of mobile gamers. They engage in battles with players across the world, experimenting with different attack strategies, while endeavoring to build an impenetrable defense of walls and towers. Currently in production. You’re a pilot with an affinity for patterns and so in battle you feel compelled to kill your enemies by color and shape. Following the pattern will get you the highest score in this rail shooter re-imagined. Deal double damage and double your points by shooting enemies of the same color as your ship. But stay on your toes! Your ship will change color if you make a match. Complete patterns to raise your multiplier. Mess it up and it goes down. Raise your score to reach higher waves and face greater challenge (and rewards!). Can you defeat the boss at the end of each wave? This is my team’s entry for the Global Game Jam 2016 in Calgary. Made in Unity in 48 hours. Secret of the Pendulum is my first professional game as Lead Game Designer. It is a free-to-play Hidden Object Adventure game on Facebook. Originally conceived as a standalone PC game, Pendulum was designed to be engaging to players through it’s serious and thoughtful storyline, and unique game mechanics involving time manipulation. While many Hidden Object games use time-travel as purely a story point, Pendulum strives to make players think about the consequences of their actions and how they will effect the game world in different times. Play it now on Facebook (Secret of the Pendulum) , iOS (Apple App Store), Android (Google Play), and Windows PC (Big Fish Games). Coming soon to Steam! SpaceShip Superstar was developed for the 2015 Global Game Jam. 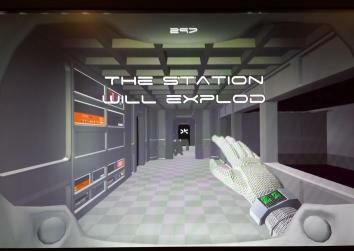 The concept was to be trapped in a space station where something has gone horribly wrong, and you have a limited time to find and fix the problem before the station explodes. The levels are randomly generated so you never quite know what the problem is or what the layout of the station is like. We decided to give it a humorous edge by making the player basically a Space-Tech-Support-Guy, who gets called in to fix relatively simple or silly problems that (for some reason) the crew of the station just couldn’t manage. We present the scenarios in a serious way, with tense music and an eerily abandoned space station, which is offset by the silliness of having to unclog a stuck toilet or reboot a computer. I joined GamesCafe near the end of development of Sally’s Studio, so I was tasked with providing Quality Assurance and Localization for the title. I was responsible for cataloging and fixing any minor graphical or grammatical issues I found, as well as overseeing the games translation into 9 different languages (none of which I could read a word of). I wrote a tool to help me in this task that would take all of the written text in the game and export it to a spreadsheet for translation. It could also re-import the text once translated, saving me a great deal of time and menial work. I was the Lead Level Designer on Leviathan, a 3D Flying Shooter, built in the Unreal 3 Engine during my final 2 semesters at SMU Guildhall. I was in charge of 9 other Level Designers, coordinating tasks and delegating work based on their interests and skill sets. Since our game was graphically intensive, I was often called upon to solve difficult technical problems in order to optimize the experience, due to my extensive knowledge of the Unreal Engine and Editor. Tourist Trap is a 2D puzzle platformer, created in my 2nd semester at the Guildhall. It features colorful and detailed artwork, 3 levels plus a bonus level, and the best use of a monkey in a video game (or so we were told). While co-designing the game with the rest of our small team, I was also responsible for designing and implementing 2 of the games 4 levels, and programming the user interface and unique game play elements.